Not In Our Name! 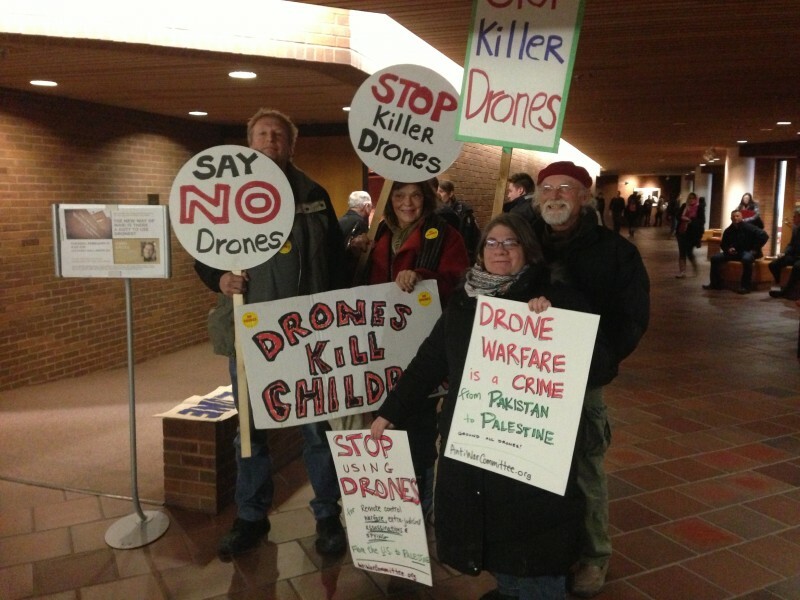 Anti-War activists confront drones advocate | Fight Back! Minneapolis, MN - Activists from the MN Anti-War Committee, Students for a Democratic Society at the U of MN, Women Against Military Madness, Veterans for Peace, and the Coalition for Palestinian Rights protested the impact of the U.S. use of drones around the world, Feb.11, at the University of Minnesota Law School. Inside the Law School, Oren Gross, a former senior officer in the Israeli Defense Force's JAG Corps, the legal branch of the Israeli military, gave a presentation titled, "The New Way of War: Is There a Duty to Use Drones?" as a part of the Law School’s spring lecture series. 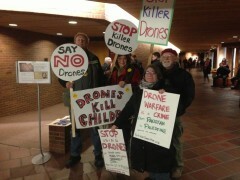 Before the speech by Gross, protesters held signs and passed out hundreds of flyers on the reality of drone warfare. Doors to the presentation were guarded by campus police, who refused to allow protesters to bring signs inside. Even so, a couple dozen community members joined the hundred or so people there for the lecture. At that point, questions were invited from the audience. Gross ducked many of them, limiting his comments to the use of drones by the U.S. Army in an active combat zone. He refused to answer questions about U.S. war policy, or the use of drones to carry out extrajudicial assassinations, or even domestic surveillance.